The first wave of cool weather had finally arrived and the Deep South morning was one of relief rather than a continued onslaught of humidity. Opening the overhead door on my garage, subtle pre-dawn light filled my shop. For my entire adult life, this time of day had reminded me of bass fishing. Perhaps it�s childhood trips � where a father introduces his son to this greatest hour in the outdoors � but something is ingrained in me, and likely others, that makes 6 a.m. just feel like fishing. Truthfully, I hadn�t been out much. Work commitments were easy to blame, but the bulk of my time had been consumed by a much more somber fact of life. My Labrador retriever, easily the greatest dog I�ve ever known, was fighting cancer, so fishing could wait. Everything could wait. Better times were ahead; this I knew. There�s a noticeable break to Florida weather in October, similar to the coming of spring in the North. Renewal comes in the form of a welcomed change that allows us to again enjoy being outside. More importantly, the shift brings an immediate drop in water temperature and a stirring in the brains of all things that swim. Bass living in this part of the world have the distinction of waiting for things to cool down in order to spawn, rather than the other way around. For that reason, pre-spawn is a time of falling temps, yet increasing activity. The time had come to begin prep for this glorious period, thus bringing me to the shop at the crack of dawn. I unloaded the rod locker on my boat for starters. With a dozen or so rods now leaning against the wall, taking inventory gave me a unique perspective of what I�ve found to be the most effective techniques for trophy bass in my area. 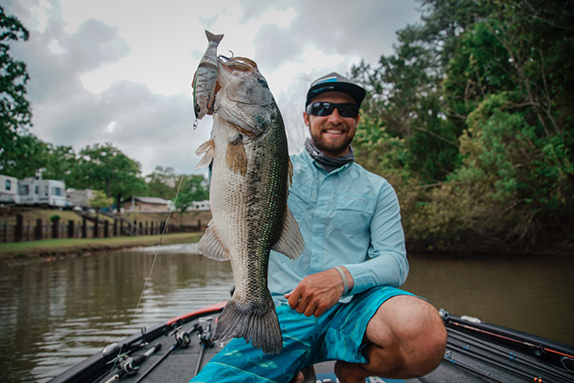 With the exception of a few recent forays aimed at quantity, nearly all of my expeditions have been in search of exceptionally large fish throughout much of north Florida. And while I�ve been unsuccessful more often than successful by most measures, each trip has bestowed me another piece of the puzzle. I�ve never been good at taking fishing advice or chasing the hot bite. Through trial and error and often taking to the outdoors alone, I�ve found my own formula for success in many things. I guess this method was born out of necessity � my early passion pursuing Great Lakes smallmouth was at a time when the sport was yet undiscovered and everything had to be learned from scratch. Today, my lunker passion walks a similar path, as information on the sport is nearly non-existent. 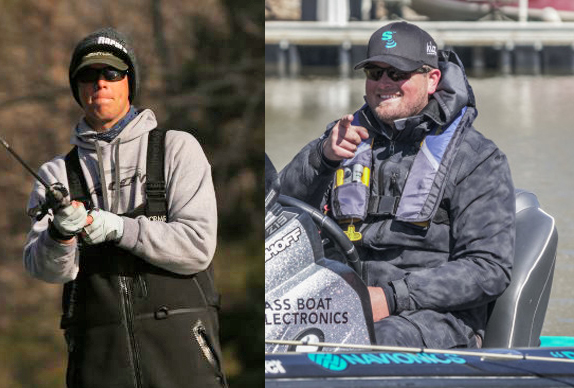 With bass fishing�s complete transformation toward tournament competition, gone is most any attention to trophy bass methods. So, starting on the ground floor is a fact of life. 2018, however, had affirmed a pattern, as my rods dictated. Sure, some of my findings are regional, but perhaps they�ll help. To begin, every rod in my arsenal is 7 feet or more in length, and likely a heavy power or heavier. It never ceases to amaze me how powerful a huge bass is when compared to, say, a 4-pounder. In the event that a lunker is hooked around cover, only a long, stout rod has any chance of holding its own in the fight. And if a lure won�t cast or pitch well on a heavy-power rod, chances are it�s not a reliable big-bass producer. Now I know there are exceptions and I�m not out to rehash every light-line lunker story out there. But for the most part, a handful of tactics can be counted on to produce big fish more often than anything else. Cutting off my lures, I lined them up on my workbench. Two punch baits. A topwater frog, Big Hammer swimbait and a high-priced Rago. I always keep the biggest freshwater Rapala in the rotation, and there was a 16-inch worm I had been playing with, along with a buzzbait. A drab swimjig featuring a heavy hook and full-size craw finished things out. 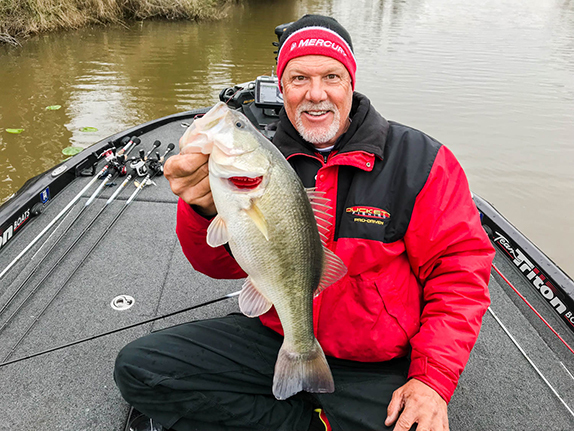 Reflecting on the lures, I�d further justified one core principle in my big bass hunting: While there are a few exceptions, steady, cast-and-retrieve style lures are top producers. No swimbait aficionado can discount the way lifelike, swimming or gliding baits seem to mesmerize giant bass, producing far better results than any other lure. The key, I believe, is their natural swimming ability. This principle holds true all across the country. The same could be said for umbrella rigs in the mid-South or buzzbaits on any water body with decent color. Large lures, swimming steadily along, often produce the biggest bass. Sure, triggering strikes and generating reaction bites will always catch fish � mid-size fish. But my results have shown that big bass would rather pursue a large, unknowing prey species in relatively open areas. An exception to this rule is when huge fish position in heavy cover. Oftentimes, for reasons known only to them, the biggest fish in an area will take residence in the heaviest cover. Such is the primary reason why so many Florida lunkers are taken on shiners; the livebaits can be fished in areas where lure fishing becomes nearly impossible. For bass anglers bound to artificials, however, enter the punch rig. Punching mats, as it�s often termed, is an evolving technique that gained a head of steam after the invention of tungsten sinkers. Using weights as heavy as 2 ounces, it became possible for anglers to penetrate cover where bass rarely saw a lure. Many large tournaments have been won punching, as the technique catches larger than average fish. To routinely score big punching, it�s important to keep your head in the game. Oftentimes, the key to the technique is covering massive amounts of water, fishing for long periods without bites. Capitalizing on strikes can be difficult, too, as hook-ups are sometimes challenging. To consistently catch trophies punching, an angler must live and die by the technique and find a tackle system they can count on. Mine centers around a 9-foot rod that doesn�t miss, and an undying dedication toward improvement each time out. In all, 2018 presented another piece of the puzzle, the one shunned by the mainstream, but increasingly important to me. With the renewal of the seasons comes a new quest, new questions and so much more to learn.